A prisoner detained on a remote island plots his escape in this second adaptation of the novels by Henri Charrière. 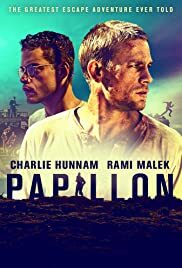 Why bother remaking the successful 1973 biography of French convict Henri Charrière nicknamed PAPILLON who escaped from Devil’s Island in 1941? After all, that film directed by Franklin J. Schaffner and starring two huge stars of the time Steve McQueen and Dustin Hoffman is still readily available on DVD.